The Beatty Transfer Station operates as a location for the deposit of municipal solid waste (garbage) for residents and businesses. Beatty Disposal transports this solid waste to the Nye County Landfill in Pahrump, Nevada. For more information, contact us at 775-553-2033. Located on Highway 374 heading toward Rhyolite. The site is accessible seven (7) days per week, 24 hours a day. Put all garbage inside roll-off boxes. Hazardous Waste is strictly prohibited in the transfer station roll-off boxes. This includes all electronic waste (computers, televisions, cell phones, stereo equipment), paint thinners, pesticides, motor oil and oil filters, herbicides, and similar products. Latex paint, however, can be dried out, and once dry, the paint may be disposed of in the trash. Please visit Nevada Recycles for more information about the disposal of hazardous waste. 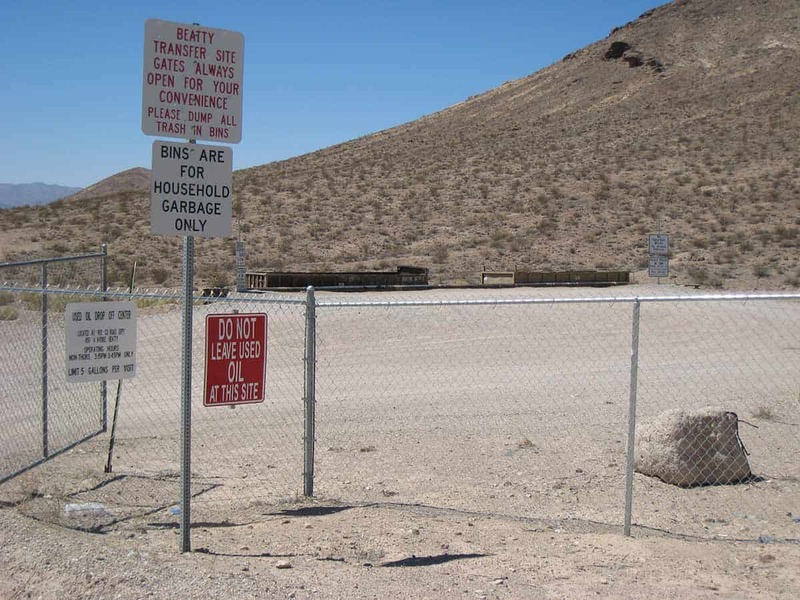 The transfer station is located on Highway 374 just outside of Beatty, heading toward Rhyolite. The transfer station is open seven days a week, 24 hours a day. Electronic waste may be dropped off at our metal yard, next to our office, located at 1410 E. Mesquite Avenue in Pahrump. Do you accept latex paint? Yes. Latex paint cans must be dried out completely and then may be disposed of in the transfer station roll-off bins. Do you accept construction materials? Yes. We accept construction materials free of charge for Nye County residents. There is a fee for commercial customers. Yes. We accept tires free of charge for Nye County residents. There is a fee for commercial customers. Do you accept medical waste? Yes. We accept home-generated sharps. Syringes and hypodermic needles must be properly packaged and sealed in an approved, puncture-proof container to be accepted. Do you accept and/or buy metal? Yes. We accept scrap metal at the transfer station for free. However, we buy ferrous and non-ferrous metals including appliances, iron, tin, copper, brass, car batteries and more at our yard in Pahrump at 1410 E. Mesquite Avenue. Our metal yard is open Monday through Saturday. Please call for hours. Do you accept hazardous waste? No. Hazardous Waste is strictly prohibited at the transfer station. Please visit Nevada Recycles for more information about the disposal of hazardous waste.